Helps horses perform longer! 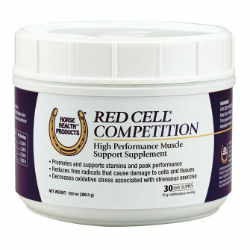 Red Cell Competition for horses supports stamina and peak performance during times of intense exercise. Powder supplement helps reduce free radicals that cause damage to cells and tissues, and supports recovery by decreasing oxidative stress associated with strenuous activity. Combines two strong antioxidants, dehydrated cantaloupe juice and vitamin E, which scavenge free radicals. Designed to be fed throughout training and competition. Enclosed scoop holds 10 grams. Feed 10 grams of Red Cell® Competition supplement daily by mixing into grain ration. Dehydrated alfalfa meal, corn oil, dextrose, dl-a-tocopheryl acetate, dehydrated cantaloupe juice, mixed tocopherols (preservative), natural and artificial flavoring.